Looking for a large, but portable projection surface to add to your mobile road-show? Look no further than the DURA TRUSS truss screen - the perfect eye catcher for your event. 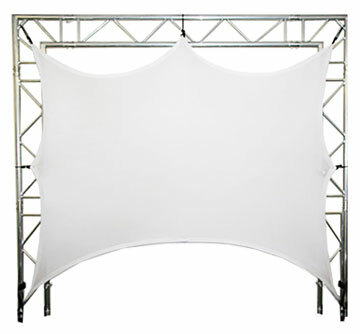 Available in various sizes, the flexible, fireproof, synthetic screen is fixed to a truss frame using integral elastic straps. This simple system ensures a professional finish at every event, while requiring minimal setup time. The white reflective surface is ideal for video presentations, slide shows, laser and gobo projections, or even as a colour washed "wall". The screen has a bright reflecting surface for vivid projected images and is wrinkle and crinkle free. The product is also fireproof and can even be washed once at 30° without the need for re-fireproofing. It is perfect for mobile road-shows as well as a host of other uses including nightclubs, trade shows, conferences and exhibitions.